During the nineteenth century, the leading idea in open space planning was to make patches of green, called parks. 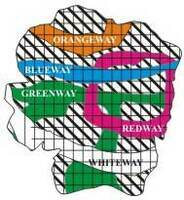 In the twentieth century, it was to make strips of green, called parkways or greenways. The argument for harlequin space, in the preceding essay, applies equally to greenways (Figure 17.1). Let us begin with the history of the idea. Greenways do not have to be green in mood. They can be red, blue, yellow, orange, purple, brown, grey, white, a harmony or a harlequin combination. Shopping streets, for example, can be greenways if they are environmentally pleasant - but their mood is unlikely to be green. If they are used only to get from shop to shop, the space will be yellow. If it also attracts fire eaters, jugglers, limbo dancers, kebab makers, chestnut roasters and evangelists, it will be red. In either case, it should be given the suffix "way' only if it provides a safe pedestrian route from one place to another place. Many roads and streets now belong to the internal combustion engine. The term "way' should be salvaged and restored to its former glory, signifying a footpath for bipeds and quadrupeds. Having a special term would assist pedestrian planners. In medieval towns, the shopping street was the central street. When vehicular traffic made these spaces unattractive, shoppers were pushed into all sorts of inconvenient backwaters. Blueways, obviously, should run beside rivers and canals. Brownways should be deep cracks, either between buildings or set into the ground, with earth, pebbles, timber and exposed rocks. Orangeways should be like esplanades -- places where one goes to be gay and to look at other people. Purpleways are for explorers, like historic trails but with an air of grandeur. Whiteways should command expansive views, on high ground, bridges, viaducts, citywalls or skyways. London, which will be used as an exemplar in the first half of this essay, had a great series of open space plans from 1925 to 1976 - but they were entirely for parkspace. Only the 1943--44 plan, by far the greatest, was inspired by the greenway concept. Since 1986, London has lacked an overall planning authority, but this has not brought London open space planning to a halt. It has simply returned landscape planning to its non-statutory origins. To me, the history of open space planning for London shows that statutory plans are unimportant, while ideas and advisory plans are vital.